In April 2011, the House Divided Project at Dickinson College launched to the public at the start of the 150th anniversary of the Civil War and now in April 2015 it is helping to commemorate the end of the Civil War anniversary with a series of special events and new resources. 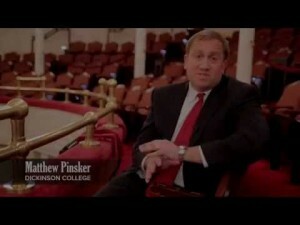 Monday, April 13, 7 p.m.
Video Tour of Ford’s Theatre, led by Dickinson professor Matthew Pinsker, available anytime here (hosted by Ford’s Theatre Society). Launched an online database, Civil War Research Engine, which America’s Civil War magazine calls “one of the most compelling sesquicentennial online projects.” The research engine now contains nearly 14,000 public domain images and over 50,000 individual records, covering the period from 1840 to 1880, with a focus on connecting visitors to events and experiences as they happened 150 years ago. Curated Lincoln’s Gettysburg Addresses, a special online exhibit featured on the Google landing page and in the Washington Post for the 150th anniversary of the Gettysburg Address. Developed an innovative online graduate course called “Understanding Lincoln,” with the Gilder Lehrman Institute of American History. The course enrolled nearly 1,000 students from 2013-14, from over forty states and four continents. Participants in this course helped build Lincoln’s Writings, a new website ranked by NEH EDSITEment as “Best of the Web” for its series on digital humanities resources. Produced dozens of free educational videos designed for classroom use and which have received more than 400,000 views via YouTube and Vimeo. These efforts include virtual tours of Gettysburg and Fords’ Theatre, close readings of Lincoln documents, interviews with leading historians, and student-produced documentary films and video tutorials. Built nearly 20 major websites on the Civil War era, including the Emancipation Digital Classroom with its popular Unofficial Teacher’s Guide to Spielberg’s Lincoln, Underground Railroad Digital Classroom, Lincoln-Douglas Debates Digital Classroom, Origins of the Civil War, A Texas Farmer’s Civil War, Cumberland Civil War, Digital Lincoln, 150 Dickinsonians, Blog Divided, and Lincoln’s Writings. Established a vibrant community of learners and educators, including a distinguished Board of Advisors (David Blight, Catherine Clinton, Eric Foner, Harold Holzer, James Oakes, and Anne Sarah Rubin), more than 50 hard-working undergraduate interns, nearly 5,000 K-12 educators trained with the project either in workshops or online, and several notable institutional partners, including the Gilder Lehrman Institute of American History, Google, and the Journal of American History. Altogether, these online resources from the House Divided Project have generated about four million page views during the four-year Civil War 150th anniversary. Yet the project will continue to grow and expand in the coming years. Please follow our progress here and on Facebook, Twitter and YouTube.